See the top Cultural trips that go through Tunisia. With 12 tours to choose from, they range in length from 3 days to 10. The most popular month for these tours is May, which has the most departures. "We really enjoyed the trip booked with saharansky. 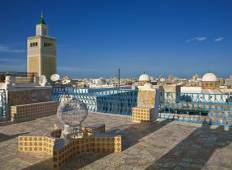 They were professional, they helped..."
"I would like to recommend SaharanSky for Tunisia experience. Maria is very helpful..."